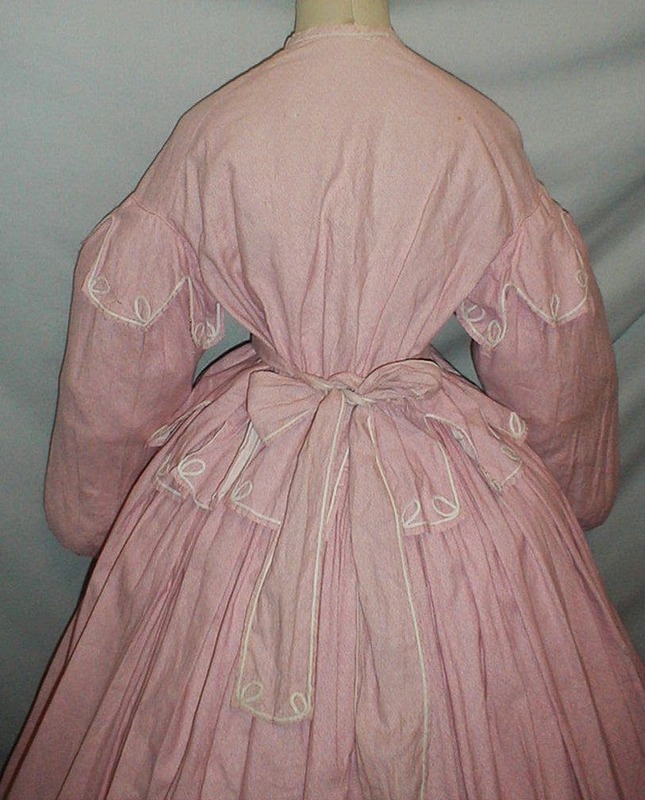 A delightful 1860’s pink cotton print dress that has been de-accessioned from a museum collection. The cataloging tag is stitched inside the bodice. 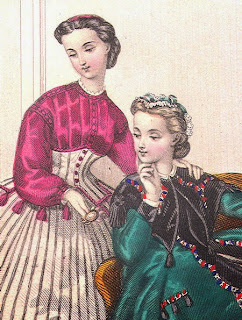 The bodice has bishop styled sleeves that are decorated with epaulettes. The armscyes are piped. The bodice hemline has a tab styled peplum. 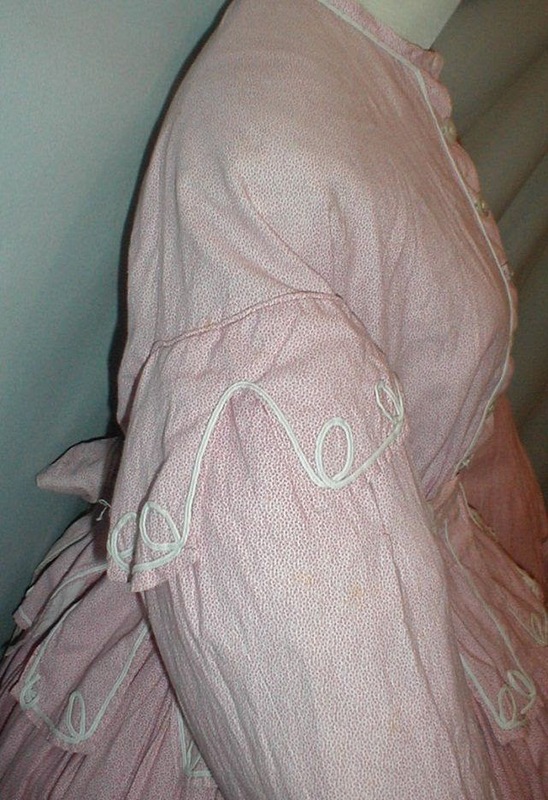 The bodice is trimmed with white braiding. It is unlined and has a front button closure. It has a drawstring waist. The full skirt is attached to a white camisole top. 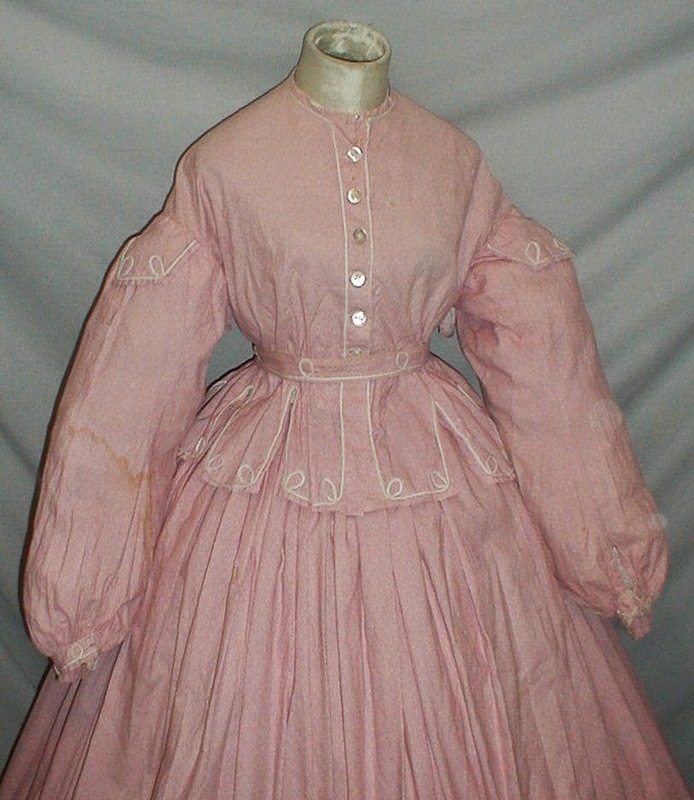 The skirt is unlined and has cartridge pleating and the waist. 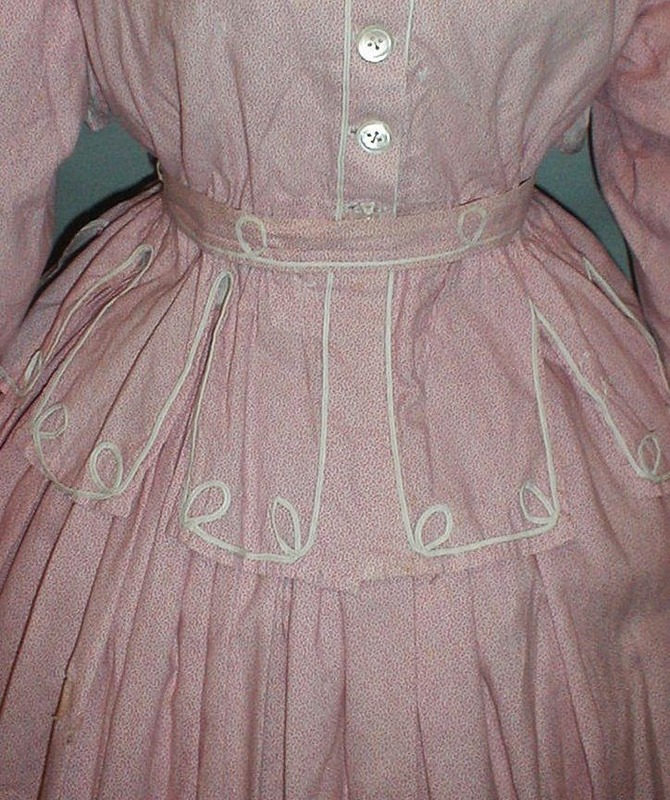 The dress comes with a separate tie belt that is decorated with white braiding. The dress is in fair condition. There are a several scattered small holes mostly in the skirt and two large mends on the edge of the skirt hemline. (See Photos.) The inside camisole top has a 4 inch split near the button holes. 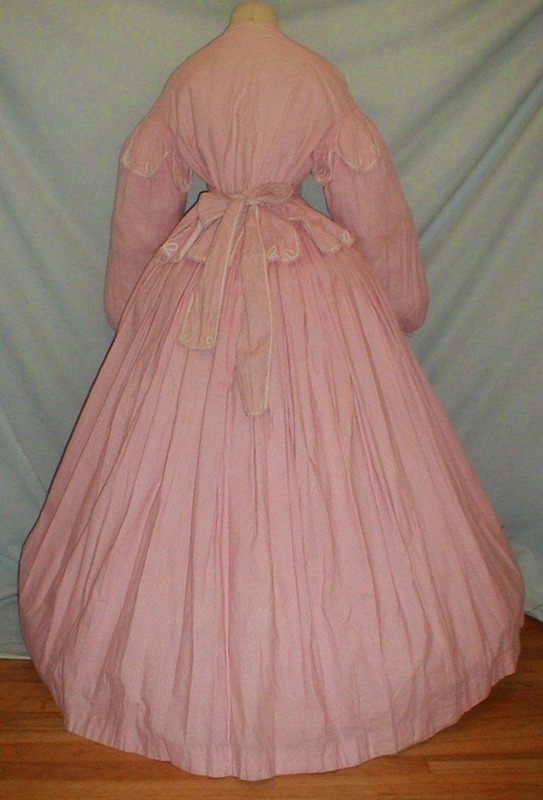 The dress is being offered for study or pattern but still makes a nice display garment. Bust 36 Waist 32 Front Skirt length 40 Back Length 45 Width at hemline 154. The corsage in the above fashion plate from 1865 has a similar waistline treatment to the extant dress. 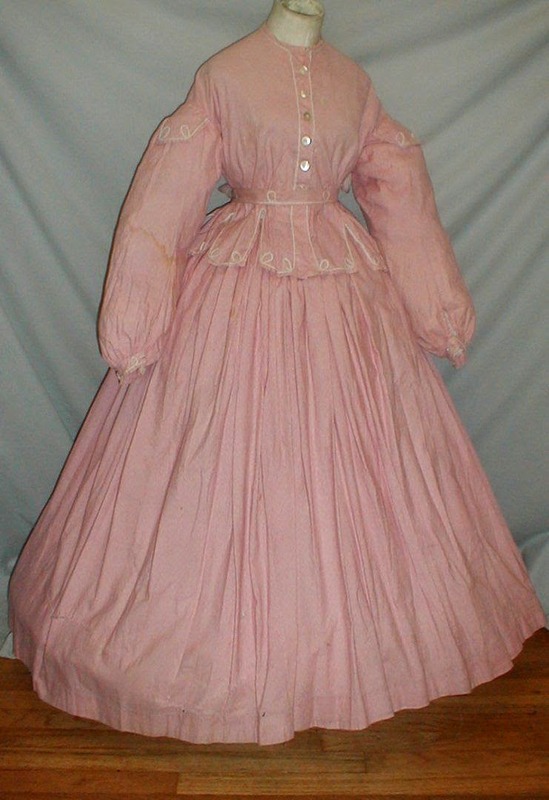 The extant dress' peplum might have been added at a later date as the fashion changed. Still, this is most likely from the tail end of the American Civil War.